More than ten years ago, I spent a little while living with a host mum in Buenos Aires. Her apartment in the chic Palermo neighborhood exuded an air of faded glory, and in our many conversations over asado and Malbec she reminisced of the times when her family was wealthy. Then came the currency devaluations. In the tragedy that is Argentine politics, my host saw the value of her savings diminish time and again, as the peso took a plunge, inflation soared and incomes stagnated. Wistfully, she spoke of those friends smart enough to park dollares in an offshore account across the river Plate. A typical South American tale of poor government and short-sighted policies, I thought back then. Little did I know that a decade later, I would find myself in a similar predicament. 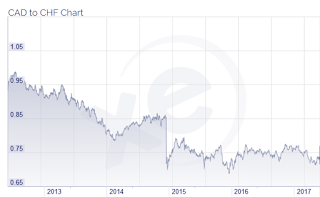 When I moved to Canada in 2009, one Canadian Dollar bought approximately 0.95 Swiss Francs, a rate that increased to 1.1 by the summer of 2010. Since then, though, it's been a steady decline. Today, that same loonie buys a mere 0.73 Francs. That is a 25% loss of value from 2009 or 34% from 2010. Visiting Switzerland has never been cheap, but the continuous erosion of Canadian purchasing power really starts to bite now. If it weren't for accommodation and transport provided by friends and family, my current trip would be a true splurge, but without the glamour factor. Or so it felt when I bought a Butterbrezeli the other day and realized that it cost the equivalent of a Montréal sushi lunch. Will I let this malaise spoil my vacation? Surely not. But it gives me more of an appreciation for what people unlucky enough to earn "soft" currencies have to contend with all the time. Not much they can do (save for that offshore banking account - surely just a coincidence that the Swiss have long excelled at that trade) - they just have to live with devaluation. And they do: The other day, walking across the lawn at the local Badi, I came by a latino-looking man lying in the sun, flipping through the flyer of a hard discount grocer. Next to him, an old-fashioned FM radio played the classic by Italian singer Adriano Celentano that drove home the point: Svalutation!